Ever since I was a young boy, I always wanted to play with tools and build things. In High School I was in the the trades department building my own furniture. For the past 10 years I have owned and operated my own Handyman business. My knowledge and skills of tools and circular saws inspired me to create my own style of art. I use wood, glass, stone, metal, shells and any type of mixed media that I can find to use in my artwork. I look into natures wood grains to help guide me where my art is going to go. 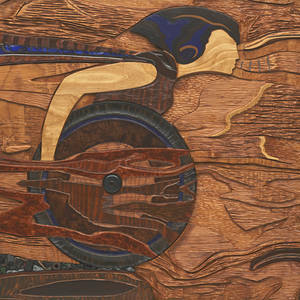 I get excited when I see images in the wood that I can then create into artwork. Nature is mysterious and beautiful. I feel if I can bring some of its hidden beauty into the spotlight, then I have done my job as an artist. I was born and raised in Rehoboth, Ma. and now reside in Haverhill, Ma. with my wife Lisa. I am a self-taught artist and have been creating art for almost 20 years. I'm inspired by, learn and educate myself with everyone and everything around me. I learn by doing. When I think I can't do something, then I dive right into it. 2017 Artwork on cover of Book "Women's Empowerment and Global Health"
2017 Best in Show "Perfect Harmony"
2017 Honorable Mention "Aztec Queen"
2017 Honorable Mention "Something Fishy"
2018 4/10-5/5 "Invincible" on display at the Attleboro Arts Museum, Attleboro, Ma. 2018 Jan. 4-Feb. "Invincible" on display Inside View Haverhill, Ma. 2018 May 17-18 "Turning the Ordinary into the Extraordinary " solo show at Willow Spring Vineyards, Haverhill, Ma.